14kg Heavy duty flywheel • Computer 5 functions: calorie, speed, scan, time, distance • Transportation wheels for easy portability. Pulse Feature on handle bars for a more in-depth workout• Heavy duty metal tubes with scratch-resistant coating • Smooth, quiet belt drive mechanism • Height adjustable multi-position handle bar. Adjustable resistance “+” “-” tension control • Horizontally and vertically adjustable saddle with quick release. Adjustable feet for stability on uneven floors.scratch-resistant coating • Smooth, quiet belt drive mechanism • Height adjustable multi-position handle bar. 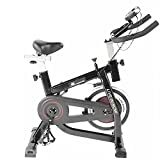 The GYM MASTER Indoor Training Bike comes equipped with a 14 kg flywheel creating momentum, which keeps the pedals moving and provides a more fluid cycling movement. PERFECT for any difficulty of workout. This translates into a non-impact workout and a fluid pedal stroke, this sturdy and highly versatile bike can deliver a complete cardiovascular workout with super smooth performance. The seat is fully adjustable both horizontally and vertically to provide the best fit possible and the most comfortable training position, including an emergency brake lever for extra safety, front mounted transport wheels add an extra level of convenience. The GYM MASTER bike is equipped with an uncomplicated resistance knob. Simply turn the dial to adjust your resistance quickly and easily all these components makes the GYM MASTER bike a perfect home cardio solution in your own time … in your own space.